Behind The Thrills | Spooky Empire: Get a glimpse of the cast of American Horror Story: Freak Show, and help a great cause! Spooky Empire: Get a glimpse of the cast of American Horror Story: Freak Show, and help a great cause! American Horror Story: Freak Show took everyone by storm. The use of actors who would have been actually considered “freaks” during the setting of the show was a bit controversial, but a great call regardless, as they all are amazing actors. Last week, Spooky Empire’s Mayhem had a large part of the “Freak Show” cast on hand for a huge Q&A. What’s more, we were able to get our hands on a piece of artwork, signed by all the attending members, which you will have the chance to bid on. All proceeds go to Give Kids the World! The cast of American Horror Story Freak show was on hand to sign autographs and meet with fans. John Carroll Lynch, Erika Ervin, Mat Fraser, Naomi Grossman, Rose Siggins, and Jyoti Amge were at Spooky all weekend, and even took part in a huge Q&A session, in which the cast answered questions about their lives and time on the set of one of the biggest shows in recent history. 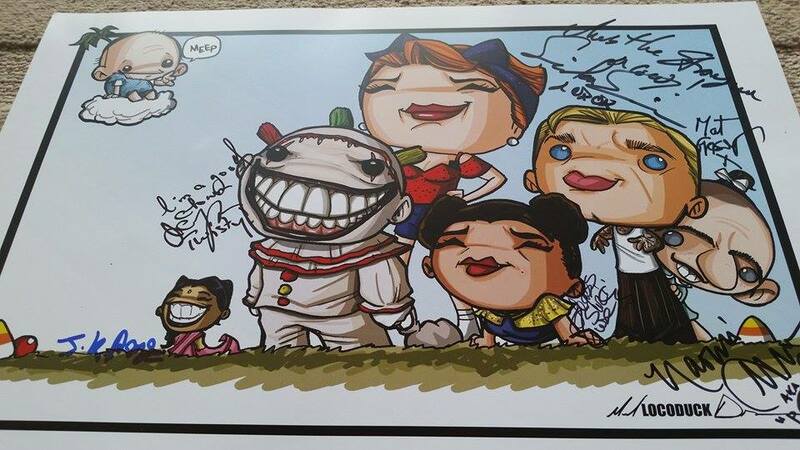 The cast was extremely generous, and gave us an amazing opportunity to bid on a unique autographed AHS: Freak Show ‘Locoduck’ caricature and 100% of the proceeds benefit Give Kids the World through Hearts of Reality. The art was exclusive to Spooky Empire: Mayhem 2015! This limited edition 11″x17″ Michael Locoduck Duron caricature features the cast members that were in attendance during the event and a special tribute to Ben Wolff who played “Meep” who died earlier this year. Autographs include Jyoti Amge (Ma Patite), Naomi Grossman (Pepper), John Carroll Lynch (Twisty), Erica Ervin (Amazon Eve), Mat Fraser (Paul the Tattooed Seal), and Rose Siggins (Legless Suzy). Click here to bid now! All proceeds go directly to Give Kids the World, via Hearts of Reality. Spooky Empire will return to Orlando this October, for the ULTIMATE HORROR WEEKEND! This year the event runs from October 30th, until November 1st, making it the biggest Halloween party ever. Stay tuned for more Horror fun, and be sure to get social with us on Facebook, and follow along with us on Twitter @BehindThrills for the latest updates! For more information about Spooky Empire, including tickets, visit the official website by clicking here! The dead rise from the grave as Spooky Empire’s Zombie Walk returns this Friday! No more Mr. Nice Guy as Spooky Empire gets Retro! The best HHN 25 video you’re ever going to see. Ever.